Reading and share top 20 famous quotes and sayings about Honeysuckle by famous authors and people. Browse top 20 famous quotes and sayings about Honeysuckle by most favorite authors. 1. "He tasted like summertime - of wicked thunderstorms, fresh clover, and wild honeysuckle - and I had the sensation of falling, my stomach tumbling over and over again until calm finally reached in, rooting deep and stretching out to encompass everything: my mind, my body. And my soul - whatever that was. The same clean, almost scentless breeze whipped over us again, just like it had the first night we'd met, and I could physically feel one chapter of my life closing and another beginning." 2. "She had died peacefully, in her sleep, after an evening of listening to all of her favorite Fred Astaire songs, one crackling record after another. Once the last chord of the last piece had died out, she had stood up and opened the French doors to the garden outside, perhaps waiting to breathe in the honeysuckle one more time." 3. "Daughters. They were sometimes as familiar and intimate as honeysuckles in bloom, but mostly daughters were mysteries. They lived in rooms you had long since abandoned and could not, did not, ever want to reenter." 4. "Raw Living: Picking blackberries, beneath late afternoon sun; a sunset reminiscent of watermelon sangria, as the scent of honeysuckle accosts me and the ducks waddle into the lake. Thanking Mama Nature for her abundance. Loving this candied-sweet southern life." 5. "Fresh, sweet honeysuckle. Ripe and rich and ready to be fucked--PLUCKED, he corrected himself, ready to be plucked." 6. "He kissed Kyle, checking to see that her eyes stayed sure and real. They did. Instead of saint and sinner, they were man and woman now. When Cole finally tasted her skin, the flavor was honeysuckle. Heaven was not something he had to die to enjoy. Kyle was here now." 7. "It was not the thorn bending to the honeysuckles, but the honeysuckles embracing the thorn." 8. "They lay on their heathery beds and listened to all the sounds of the night. They heard the little grunt of a hedgehog going by. They saw the flicker of bats overhead. They smelt the drifting scent of honeysuckle, and the delicious smell of wild thyme crushed under their bodies. A reed-warbler sang a beautiful little song in the reeds below, and then another answered." 9. "John Mandrake was an attractive young man, and the scent of power hung about him, sweet and intoxicating, like honeysuckle in the evening air." 10. "I pushed her shiny blond hair away from her face and leaned down, our faces only inches apart. She inhaled softly, our lips so close I could feel her breath and the scent of her skin, like honeysuckle in springtime. She smelled like sweet tea and old books, like she had always been here.I pulled my fingers through her hair and held it at the back of her neck. Her skin was soft and warm, like a Mortal girl's. There was no electric current, no shocks. We could kiss for as long as we wanted. If we had a fight, there wouldn't be a flood or a hurricane, or even a storm. I wouldn't find her on the ceiling of her bedroom. No windows would shatter. No exams would catch fire.Liv held up her face to be kissed.She wanted me." 11. "You smell like honeysuckle. You likin' ole Jack now? ""I never stopped liking you. Even when you were warding me away with the power of Catholicism." 12. "On the warm stone walls, climbing roses were just coming into bloom and great twisted branches of honeysuckle and clematis wrestled each other as they tumbled up and over the top of the wall. Against another wall were white apple blossoms on branches cut into sharp crucifixes and forced to lie flat against the stone. Below, the huge frilled lips of giant tulips in shades of white and cream nodded in their beds. They were almost finished now, spread open too far, splayed, exposing obscene black centers. I've never had my own garden but I suddenly recognized something in the tangle of this one that wasn't beauty. Passion, maybe. And something else. Rage." 13. "How lucky country children are in these natural delights that lie ready to their hand! Every season and every plant offers changing joys. As they meander along the lane that leads to our school all kinds of natural toys present themselves for their diversion. The seedpods of stitchwort hang ready for delightful popping between thumb and finger, and later the bladder campion offers a larger, if less crisp, globe to burst. In the autumn, acorns, beechnuts, and conkers bedizen their path, with all their manifold possibilities of fun. In the summer, there is an assortment of honeys to be sucked from bindweed flowers, held fragile and fragrant to hungry lips, and the tiny funnels of honeysuckle and clover blossoms to taste." 14. "Piper leaned toward [Jason], her caramel braid falling over her shoulder. Her multicolored eyes made it hard for him to think straight. "And where is this place?" she asked."A . . . uh, a town called Split.""Split." She smelled really good—like blooming honeysuckle. "Um, yeah." Jason wondered if Piper was working some sort of Aphrodite magic on him—like maybe every time he mentioned Reyna's name, she would befuddle him so much he couldn't think about anything but Piper. He supposed it wasn't the worst sort of revenge." 15. 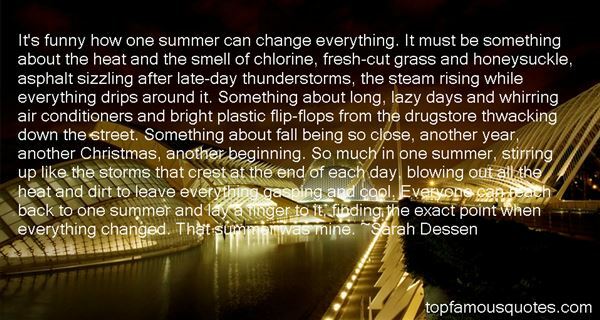 "It's funny how one summer can change everything. It must be something about the heat and the smell of chlorine, fresh-cut grass and honeysuckle, asphalt sizzling after late-day thunderstorms, the steam rising while everything drips around it. Something about long, lazy days and whirring air conditioners and bright plastic flip-flops from the drugstore thwacking down the street. Something about fall being so close, another year, another Christmas, another beginning. So much in one summer, stirring up like the storms that crest at the end of each day, blowing out all the heat and dirt to leave everything gasping and cool. Everyone can reach back to one summer and lay a finger to it, finding the exact point when everything changed. That summer was mine." 16. "But enough of that--here I am. Hineni! How marvelously beautiful it is today. He stopped in the overgrown yard, shut his eyes in the sun, against flashes of crimson, and drew in the odors of catalpa-bells, soil, honeysuckle, wild onions, and herbs." 17. "The great hall was shimmering in light, sun streaming from the open windows, and ablaze with colour, the walls decorated with embroidered hangings in rich shades of gold and crimson. New rushes had been strewn about, fragrant with lavender, sweet woodruff, and balm... the air was... perfumed with honeysuckle and violet, their seductive scents luring in from the gardens butterflies as blue as the summer sky." 18. "I drag myself over to the honeysuckle bush and pluck a flower. I gently pull the stamen through the blossom and set the drop of nectar on my tongue. The sweetness spreads through my mouth, down my throat, warming my veins with memories of summer, and my home woods and Gale's presence beside me." 19. 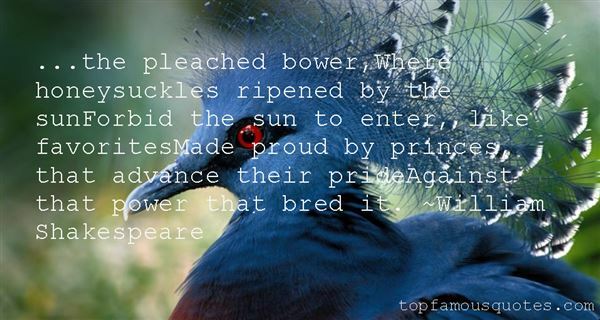 "...the pleached bower,Where honeysuckles ripened by the sunForbid the sun to enter, like favoritesMade proud by princes, that advance their prideAgainst that power that bred it." 20. "A southern moon is a sodden moon, and sultry. When it swamps the fields and the rustling sandy roads and the sticky honeysuckle hedges in its sweet stagnation, your fight to hold on to reality is like a protestation against a first waft of ether." Don't give up. Don't lose hope. Don't sell out."